W&L’s Alison Bell Featured in The Daily Progress The story featured Bell and her work studying cemeteries in the Shenandoah Valley. Alison Bell, associate professor of anthropology at Washington and Lee University, was featured in The Daily Progress in Charlottesville, VA for her work studying cemeteries in the Shenandoah Valley. Bell was also interviewed recently for a piece on Virginia Humanities website. can also be accessed online at The Daily Progress. Alison Bell got hooked on cemeteries when she saw a tombstone in Staunton inscribed “Monsters from the Vault” and decorated with the faces of Dracula and Frankenstein’s monster. Bell looked up the dead man’s name and saw that he had loved classic horror films. The stone was the perfect way to commemorate him and his involvement with other horror fans. Bell, now an associate professor of anthropology at Washington and Lee University in Lexington, is using a yearlong fellowship with the Virginia Foundation for the Humanities to study cemeteries up and down the Shenandoah Valley. 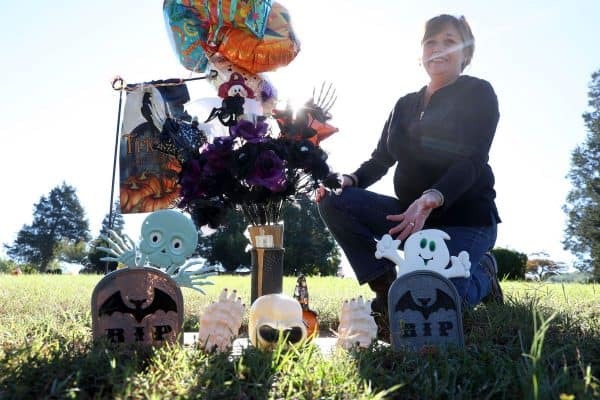 From that work, she said she’s learned a lot about how Virginia communities today approach death and especially how living relatives include the dead in holiday celebrations. Most people don’t put monsters on their graves. But during the fall, and every holiday season, memorials and decorations such as pumpkins, scarecrows and cartoon ghosts sprout up in cemeteries. Earlier this month, Bell pulled on hiking boots and drove to the Monticello Memory Gardens. She pointed out the marker of a 10-year-old boy that was etched with light sabers, a plaque inscribed with Gaelic lines from William Butler Yeats’ poem “The Stolen Child” and the cremains urn of a longtime University of Virginia electrician. Each of the graves was decorated with pumpkins, fabric fall leaves, scarecrows and plastic witches. Some Halloween decorations mingled with birthday balloons, Easter rabbits and snowmen. Bell marked some of the graves by taking photos on her phone. Some people would find researching cemeteries morbid, and decorating gravestones disrespectful, but Bell said both are a way of connecting with loved ones. Bell has found the obituaries of many of those with decorated graves and can recite the names and occupations of many of the dead. She has reached out to the families of some, trying to figure out why they decorate the graves as they do. The decorations in Virginia cemeteries often connote a rural identity, she said, pointing to a sense of community with other farmers, fishers and all-terrain vehicle drivers. Bell grew up in Tennessee and North Carolina. After completing master’s work in California, she packed up and brought her iguana, Wilma Jean, to the University of Virginia for a doctoral program. She said she feels Virginia is a place where rural, religious and elite cultures meet and mix. The trends cut across social divisions, Bell said, and represent an idea that the living and the dead continue in the same community. Beginning in the 1980s, she said, new technology and growing secularization encouraged family members to mark graves as a way of remembering group identity and cultivating social ties. Most of the students in her popular Washington and Lee class Domains of the Dead think it’s weird to visit cemeteries — at least at the beginning. One of Bell’s former students, Sara Prysi, a senior, used to hold her breath when she walked past graveyards. Prysi said she was skeptical about the class, but Bell was her adviser in the anthropology department, so she decided to give it a try. Once she got over her fear, Prysi said the class inspired her to do a yearlong independent study with Bell and has made her more interested in collective cultural acts. Another Washington and Lee student, Bryan D’Ostroph, spent a summer after taking Bell’s class traveling to cemeteries in his home state of North Carolina. His grandmother got interested in the project and now texts him pictures of interesting headstones she sees. Bell said she has visited most counties in the Shenandoah Valley with her camera and her notebook. She’s dragged her 15-year-old twins on field trips from Wytheville to Winchester. Bell helped to bury her father, cremate her mother and order a footstone for her grandmother’s grave. The plots are in North Carolina, so she doesn’t visit often, but when she does, she leaves butterfly ornaments and apples. A butterfly ornament hung above her grandmother’s bed for years, and her grandfather took her to orchards in the summer.